Dr. Chuck Stecker is the President and Founder of A Chosen Generation. Chuck is an ordained minister of the Gospel and has earned a Doctorate of Ministry and Ph.D. in Communications specializing in Christian Leadership. Chuck served in the US Army for over 23 years in various key leadership and staff positions, including 3 years on the Joint Staff in the Pentagon. Chuck has served the Lord in the local church in various ministry and leadership positions. He served with Promise Keepers for three years as a Regional Director and then launched A Chosen Generation. Chuck authored Men of Honor Women of Virtue: The Power of Rites of Passage. Chuck combines years of business experience, military service and nearly 20 years of vocational ministry to help churches and ministries develop clear strategies to equip and train a new generation of leaders. He has a passion to see churches return to truly intergenerational communities. He has been married to Billie for over 35 years and they have three children and three incredible granddaughters and one grandson. Brandon Sewall was a military brat and a military member so he moved around a lot, but home is where the heart is and his heart is in the mountains of Colorado. 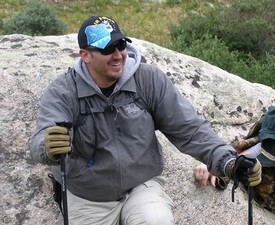 Brandon is an avid hiker and has conquered several of Colorado’s 14er mountains. He also enjoys hunting, both archery and long rifle, as well as fishing, camping, mountain biking, and basically anything that has to do with the Colorado outdoors. As a jack of all trades, Brandon also is a musician, enjoys wood working, firearms and archery marksmanship, and emergency preparedness training.